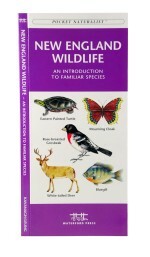 New England Wildlife, An Introduction to Familiar Species, is a beautifully illustrated guide from Waterford Press that highlights over 140 familiar species of birds, mammals, reptiles, amphibians, butterflies/insects, fishes and seashore life. 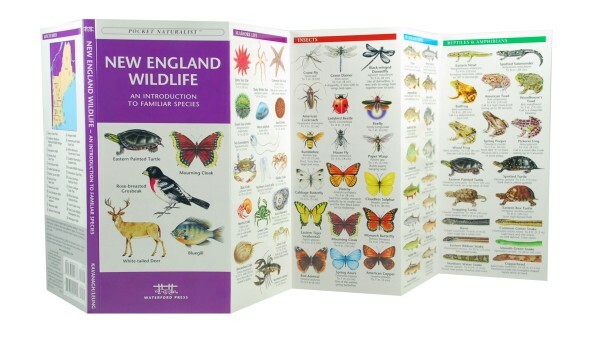 New England Wildlife is the perfect pocket-sized, folding guide to familiar animals found in Maine, Vermont, New Hampshire, Massachusetts, Rhode Island and Connecticut. This beautifully illustrated guide highlights over 140 familiar species of birds, mammals, reptiles, amphibians, butterflies/insects, fishes and seashore life and includes a map featuring prominent regional wildlife-viewing hotspots. Laminated for durability, this handy Pocket Naturalist Guide from Waterford Press is a great source of portable information and ideal for field use by novices and experts alike.